Is there any way to avoid re-customizing my theme from scratch? We frequently update our themes to include new options and features, support for new Shopify updates, performance improvements and bug fixes. Theme versions and their release details can be found in each theme's release notes. You can find out what version you're running in the footer of the Theme settings tab. We'll walk you through our recommended process for updating a theme manually below. Major theme updates with new features will require you to update the theme. Please contact our support if you have any questions about updating between versions. 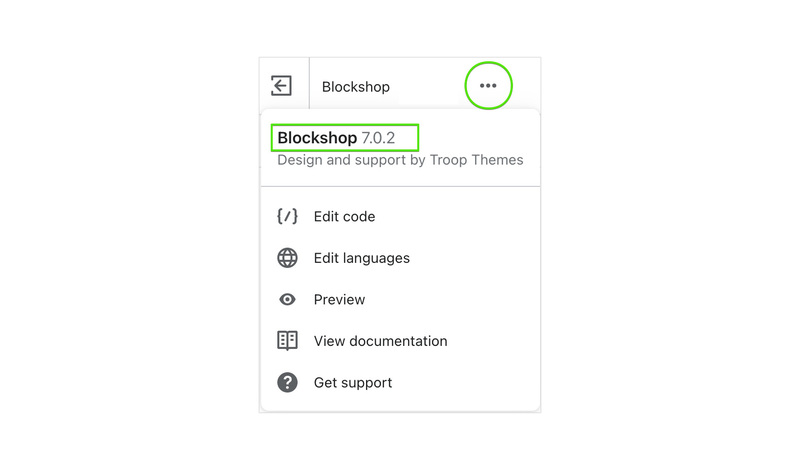 Why are there no automatic updates on themes in Shopify? This is because themes are often customized by storeowners and automatic updates would overwrite those customizations. Software and apps can be routinely updated, but themes are designed to be customizable by you to suit your needs and reflect your brand. If we ran automatic updates on themes, you would lose all of your customizations. Run through your list of installed apps and third-party code that has been added in. You’ll want to have a list of all these to keep a record of what needs to be transferred over. Download a copy of your theme. It's always a good idea to have a local backup you can revert to if need be. To download your current theme, click the Actions dropdown on your live theme and select the Download theme file option. To download the latest version, navigate to the theme's listing page and click Add latest theme version. The theme will be added to the top of your Themes page in your store admin. Now it's time to reapply your customizations made in the theme settings. To speed things up, open the theme editor for both the published (live) and unpublished versions in separate tabs or side-by-side windows. Go through the new theme section by section and match the settings from the old version. Comparing the two helps you to familiarize with and set up any new features and settings. Migrate custom code If you have made customisation to any of the theme's template files or added custom CSS via the template editor, you'll want to transfer those across. Apps that required you to add code to your theme’s files will need to be reinstalled. You’ll need to revisit the app documentation and follow the installation instructions on how to do this. If you’re unsure how, you can go to Apps and click 'View Details' to find the support email for that Shopify app. One you’ve migrated all your settings and custom code, you’re set to go. When you publish the new version of the theme, the old version will be stored in your dashboard and you can revert back to it at any time. You can copy across theme customizations from the current version to a new version with a bit of handy work. 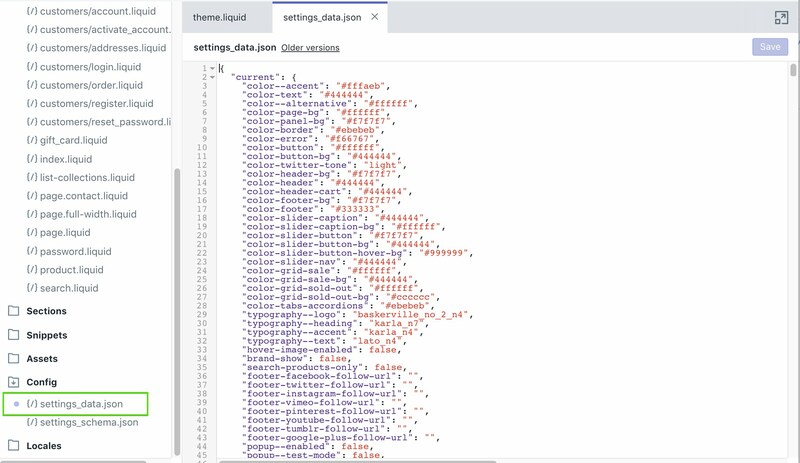 All of the customization made in the Theme editor are recorded in your settings_data.json file. From the template editor, navigate to the Config folder. Copy the contents of the settings_data.json file from the current theme to the new version. This file contains all the values of customization and will be carried across to your new version. Although this may be a faster way to reapply your theme settings, it may not work between versions too far apart. If you have any questions about updating between versions, feel free to contact our support.